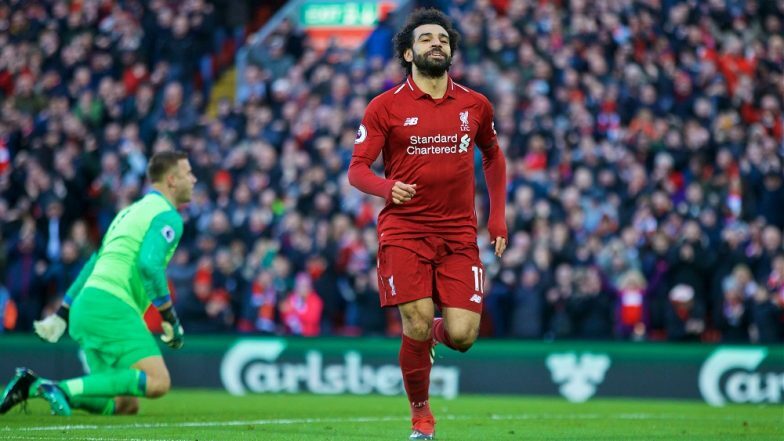 London, April 15: Liverpool seems to have learned a thing or two as they prevailed over Chelsea 2-0 on goals by Sadio Mane and Mohamed Salah to stay in the fight for the Premier League title. The victory enables Liverpool to stay ahead of Manchester City, who have a match in hand, with four matches to go in one of the tightest Premier League seasons in recent years, reports Efe news. The game was also special for coach Jurgen Klopp since it was his 200th as Liverpool's manager, although the first 45 minutes did not live up to expectations. Liverpool, led by Salah and Mane, dominated in terms of ball possession, while Chelsea, who are seeking to secure a berth in the UEFA Champions League next season, waited for the chance to counterattack. However, Chelsea failed to make the most of the opportunities they had on the counter, while Mane, at the other end of the field, lacked precision on the final touch. Man Who Abused Liverpool’s Mohamed Salah Will Face a Lifetime Ban From Attending Matches (Watch Video). This set Chelsea, missing Rudiger due to a knee injury, back a step, while Liverpool sought the three points and the home side was rewarded. After a combination between Jordan Henderson and Salah inside the area, the Englishman passed the ball to Mane, whose header got past Kepa. Just two minutes later, Chelsea endured another blow as Salah got the ball down the right side and fired a shot that not only doubled Liverpool's lead, but also allowed him to get back into the top spot of the Reds' top scorer list that he had temporarily conceded to Mane. It was too late for coach Sarri to make changes, although he sent Gonzalo Higuain onto the field, but they were already down 2-0. Hazard, however, had a couple of chances, although first he hit the woodwork, and then Alisson Backer cleared the ball off the goal line.